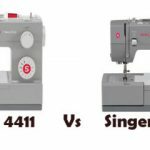 A honest comparison between two affordable heavy duty sewing machines, the Singer 5532 and 4423. From the outside, both look similar but there is a difference. 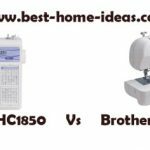 If you are looking for an affordable heavy duty sewing machine in US, you will come across Singer 5532 and 4423 for sure. 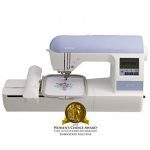 In fact Singer 4423 was ranked first in Sewing Machine Reviews list of most affordable heavy duty sewing machines in US for the year 2014. 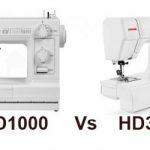 I am not trying to say that these two are the best heavy duty machines you can get, there are many other well performing heavy duty models like the Janome HD3000, but for that you will have to spend double the amount of money you are spending on a 5532 or a 4423. Earlier, there was a huge price difference between 5532 and 4423, now it has changed drastically. If you go by the current price, 4423’s price has increased by $20 – $25 and that of 5532 has decreased $5 or so (when compared to the price 3 months ago). This makes the comparison even more interesting. When you look from outside, you can’t tell the difference between the two. The design and construction is the same. Singer has used the same motor and almost all the parts are same. First let us have a look at the areas where the difference lies. Built-in Stitches : This is the only area where there is a difference between 5532 and 4423. 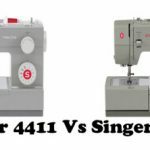 5532 is a step above 4423 in terms of built-in stitches (actually Singer is charging the extra money for the extra stitches). 5532 comes with 32 built-in stitches whereas 4423 has only 23 stitches (this is evident from the last two digits of their model numbers). That’s it. Other than the built-in stitches, these two machines are identical ‘literally’. There is no point in comparing the performance of these two machines as they are identical. In general, both the machines have great stitch quality and works really well on multiple layers of denim. The selling point of these two machines are their prices. You can go with 5532 if you consider 9 extra stitches as important. But if you don’t need those stitches, 4423 being cheaper is the better option. In simple words, if the price difference between 5532 and 4423 is more that $25, then go with 4423. Because anything more than $25 is not really worth for just 9 stitches.